Petra®. Behind this name there is a complex system of products, workshops, communication, research, events and partners, that guarantee ongoing technological innovation. Petra is based on the climatic selection of wheat and brings together farmers, millers and food artisans in order to provide a clean, healthy and honest food, with a contemporary take on the traditional Mediterranean diet. FOR ITSELF as a top-quality flour. It represents the Quaglia family, four generations of millers that have transformed simple wheat grain into state-of-the-art ingredients. It represents the farmers that grow wheat in the fields, the millers that grind the grain, the food artisans that prepare the bread and the people that enjoy its wonderful taste. 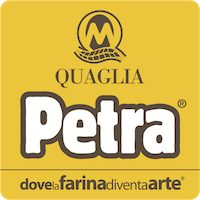 Petra flour line is dedicated to the most creative food artisans. Petra is a natural flour, organic or conventional, stone milled using the innovative augmented stone milling system, or finely ground using cast-iron cylinders. Integrated agriculture techniques, the selection of grains using the only state-of-the-art optical sorter present in Italy and an accurate control of seed granulometry that guarantees the maximum food safety achievable today. Petra broadens the horizons of food artisans. Whoever uses Petra in their daily work can enrich it with their own experiences and creativity, inventing new and healthy recipes. Petra is chosen by a new community of contemporary food artisans that are conscious of their own gastronomic culture and want to transfer it to others. Petra is a versatile and easy to use wheat flour line. These genuine flours give a unique and well-rounded wheat flavor to all bakery products.